PES Metrology were asked to consolidate and extend a precision measurement network throughout the new Bloomberg European Head Quarters in London. 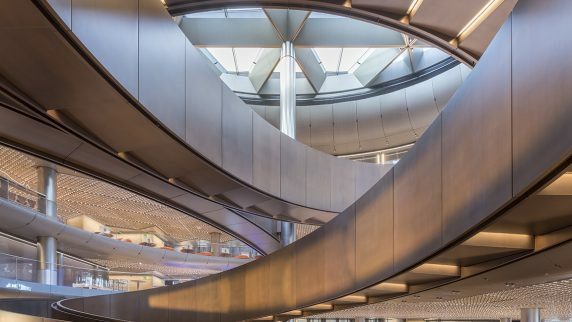 Bloomberg’s new headquarters, billed as "the most sustainable office building in the world" opened 24th October 2017 and comprises of two buildings, connected by glazed bridges across a retail arcade that bisects the site. Covering an area of 102,190m² the interior is dynamic and fluid providing unprecedented flexibility and amenity for staff. One of the key features of the building is an internal ramp/stairwell which will give staff access to each of the floors, the unique design of this feature meant that it can only be inspected using modern scanning equipment supported by a robust measurement network. Upon arrival levels 2 to 5 of the building contained 3 separate types of datum networks: 1) Surveyors nails for the layout out low precision internal walls and concrete features 2) Reflective tape targets for installing low tolerance steel work for the internal ramp and 3) Laser Tracker datum nests for high tolerance critical features of the ramp. Unfortunately the 3 networks did not tie in accurately and problems arose when discrepancies of up to 16.52mm were recorded. PES Metrology used 2 x Leica AT401 Laser Trackers and 1 x Leica TDRA6000 Total Station along with 3 sets of SpatialAnalyzer® Ultimate 3D measurement software to measure all pre-existing datum targets on floors 2 to 5 of the building. PES began by re-measuring the surveyor’s nails on the 2nd floor using an AT401 to an accuracy of ±0.1mm, followed by all 1.5 reflector nests visible from that location. The TDRA6000 was used to characterise all reflector tape targets that a laser tracker is unable to read due to its EDM distance meter technology. PES then added between 10 to 20 laser tracker targets to each floor to create a more robust, stable network and then extended the network up to the 8th floor of the building. Once all the datum targets had been installed and measured, PES generated a Unified Spatial Metrology Network (USMN) in SpatialAnalyzer® 3D measurement software which calculates an uncertainty field for each measured point. The resultant network is not only more robust, but measurement uncertainty is quantifiable which allowed weak areas to be addressed and strengthen via subsequent instrument sets. Once the network was complete and submitted to the main contractor, it allowed the numerous contractors to use their wide variety of technologies to measure from one precise, concise network and work side-by-side in a seamless fashion.